I scrapbook for me. I scrapbook because I have a very unhealthy pretty paper addiction. I scrapbook because I’d like to think it’s cheaper than therapy (the jury is still out on that one). I scrapbook because I enjoy the social outing of going to a crop and sharing stories with girlfriends. Lately I’ve been doing a lot of these ScrapMuch? challenges because my stash of paper, embellishments and pictures was just getting overwhelming and I had no idea where to begin with it all. I always start with the best of intentions, but you know what they say about that. The great news is, I’m slowly working through it all and I’ve been pleased with the end results. It’s been great to get all these papers and products out of hiding. The bad news is, my 12×12 albums are almost all full and my stash of my first love mini albums is a touch neglected. I’m sure I’ll be remedying that very soon. I digress.. When I opened my google reader this morning I found the sweetest surprise. 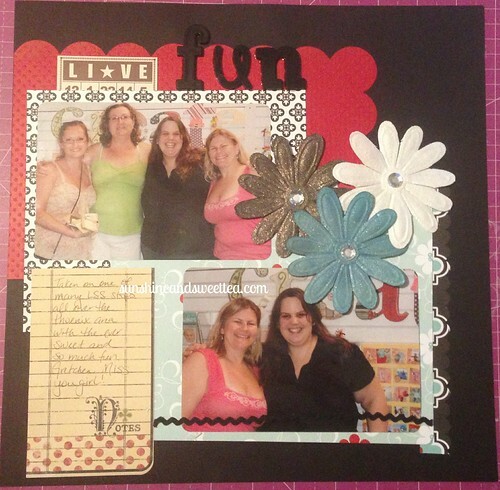 My colour challenge layout was the one chosen to be featured on the ScrapMuch? blog! Check it out here! I’m so very flattered, and quite frankly shocked. Thank you so much! I’ve never been featured before, never published, never been on a design team. So needless to say, for me, this is a pretty awesome first! Thank you ScrapMuch? for the feature and for the opportunity to play along with these fun challenges!